Thevenizing is based on the idea of using superposition to analyze a circuit. When you have two different variables affecting an equation, making it difficult to analyze, you can use the technique of superposition to solve the equation, provided that you are dealing with linear equations (by luck all these basic components are linear; even if you might not think it when looking at the curve of an RC time response, it actually is a linear equation). The idea of superposition is simple: When you have multiple inputs affecting an output, you can analyze the effects of each input independently and add them together when you are all done to see what the output does. One idea that comes from superposition is Thevenin's Theorem. 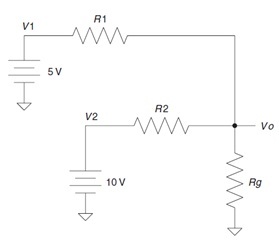 Using Thevenin's Theorem allows you to reduce basically any circuit into a voltage divider. And we know how to solve a voltage divider, don't we! There is a sister theorem called Norton's, which does the same thing but is based on current rather than voltage. Since you can solve any electrical problem with either equation, I suggest you focus on one or the other. Since I like to think in terms of voltage, I prefer Thevenizing a circuit to the Norton equivalent. So to be true to the idea that you should only learn a few fundamentals and learn those well, we will focus on Thevenin equivalents. Once all the voltage sources are shorted and all the current sources are opened, all the components will be in series or parallel. That makes it very convenient for those of us who only want to memorize a few equations! Apply those basic parallel and series rules we just learned and voilà, you have a circuit that is much easier to understand. Once you have reduced the resistors, inductors, and caps to a more controllable number, you replace each source one at a time to see the effects of each source on the component in question. When you have considered the effects of each source one at a time, you can add them all together to see the overall effect. In this process of Thevenizing the circuit you are superimposing each output on top of the other to get the output of the combined inputs. I fi nd it helps when Thevenizing a circuit to try to imagine that you are looking back into the circuit from the output. This means that you imagine what the circuit looks like in terms of the output. We often think in terms of stuff that goes in the input. Something goes in, something happens, and then it comes out the output. Try flipping that notion on its head. Think, "Here is the output, what exactly is it hooked up to? What are the impedances that the cap in this case ' sees ' connected to it? " Once you are able to adjust your point of view, Thevenizing will become an even more powerful tool.